Strengthen the immune system, lower cholesterol levels! Also known as 'Jiaogulan,' this variety is said to have immune-strengthening properties; some even call it the 'anti-aging' or the 'cure-all' herb! Brew 'Immortality' and enjoy the healthy benefits of this sweet-flavored curing tea! 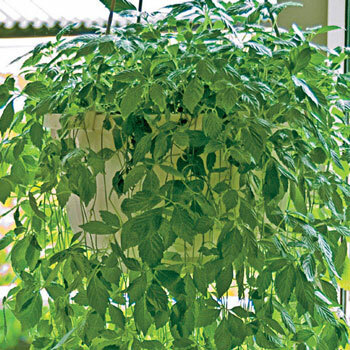 Grown in a pot or hanging basket, the vines will cascade over the edge for a dramatic decorative effect; if allowed to grow up a trellis or supported by stakes, the vines will reach up to 25' long. Suitable for inside or out. This delightful shrub will perfume the summer air with a sweet fragrance—so you'll want to plant it where its perfume can be enjoyed. Goldflame Honeysuckle's 2" flowers are a pretty rose-pink with yellow interiors. 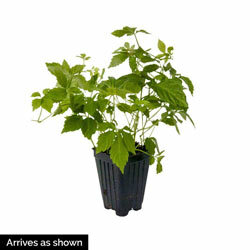 Its oval, blue-green leaves have stems with a reddish hue. This honeysuckle can be grown as a twining vine on a trellis or fence, or sprawling over stone walls. Many gardeners like to plant it near windows, doors and patios so they can enjoy its sweet fragrance. 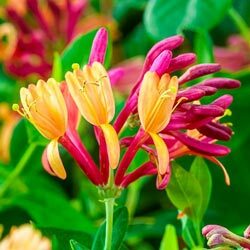 Goldflame Honeysuckle is easy to grow and prefers well-drained soil in full sun to partial shade. Deer tend to avoid. Soil Requirements: The plant prefers light (sandy), medium (loamy) and heavy (clay) soils and well drained soil. Prefers acid, neutral and basic (alkaline) soils.